I've been to bridal showers at restaurants and others at someone's home. Both are great. 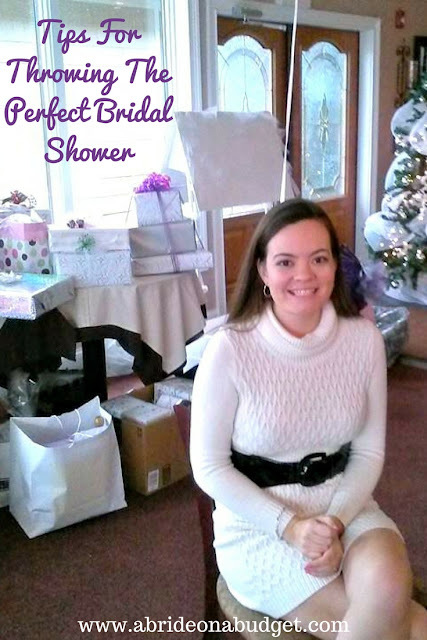 But, I'll be honest: If you throw a bridal shower at your house, it's a lot more work. We host themed parties all the time (New Year's, Super Bowl, etc. ), and the biggest tip I can give you is make as much as you can ahead of time. Like my Chocolate Cracker Bark (known in some circles as saltine toffee bark). My mom got this recipe from one of her former coworkers. It's a lot easier than some of the recipes for this. And easier is better when you have to cook, decorate, and create games for a bridal shower. Some recipes for saltine toffee bark ask you to melt butter and sugar to create a caramel. I've done that before to make homemade toffee, and, while it's delicious, it's sticky and a lot of cleanup. My Chocolate Cracker Bark is a lot simpler. Plus, you can make this saltine cracker candy recipe ahead of time. You can make it the weekend before the shower, if you have extra time and cross it off your list. That way, you have one thing less to do during bridal shower week. I used traditional, salted crackers for this recipe. My mom prefers to use whole wheat saltines. Either works, but, to be honest, I laugh at the thought of using whole wheat in these -- because she does it since she says they're healthier. If I'm covering this treat in melted butter and chocolate, I'm pretty sure healthy is not the key word in the recipe. But if whole wheat makes you feel better about a stick (or two) of butter, they're fine too. I'm a big fan of simplifying everything for this recipe ... even the clean up. You're going to have a lot of cleaning to do between getting your home ready for the bridal shower and then cleaning up after the party. So simplify the cleaning you do from cooking with an silicone baking mat. It's actually a good thing to use when you're baking cookies. It helps to transfer the heat in your pan so that you cookies bake evenly (hence the name). An additional perk is that you can just pull it out of your cookie sheet when you're done baking and you don't have to scrub the cookie sheet. You also don't have to use something disposable like foil or parchment paper, so you're saving the Earth as well. Then, line a 16x11 cookie sheet with a silicone baking mat. Top it with one layer of salted saltine crackers (36 crackers should fill your entire sheet). Bake for 15 minutes, until the crackers start to brown and the butter starts to bubble. Top with the chocolate chips and stick it back in the oven for two minutes. While that's in the oven, finely chop your chopped walnuts. I always chop mine smaller than they come in the package. When the chocolate is melty, take the crackers out of the oven and spread the chocolate with a knife. Quickly top with walnuts. My tip: Use a clean knife to push the walnuts down into the chocolate. If you don't, they will all fall off. Cool it on a counter for about 30 minutes. Then, put it in the fridge for a couple hours (or a couple days; like I said, you can make this ahead of time). When you're ready, pull the cookie sheet out of the fridge. You can then snap the chocolate cracker bark apart into large pieces. Put them back in the fridge until you are ready to serve. You could probably make Club cracker toffee by using Club crackers instead of saltines. But, if I'm throwing the shower, I'm gonna use Club crackers to make our Bacon-Wrapped Crackers with brown sugar instead. BRIDAL BABBLE: Would you make this Chocolate Cracker Bark? Love Love Love this recipe. Pinned! Thanks for sharing on To Grandma's House We Go!